This soup is great as a meal on its own, or as a hearty snack or side, and is packed with winter vegetables, like kale, parsnips, turnips and carrots. This winter veggie soup offers tons of antioxidants, like beta carotene (which is converted in our bodies to form vitamin A) and vitamin C, along with nutrients like folate, potassium and vitamin K. Also, this soup contains fiber and lean protein, which is perfect for filling you up, without filling you out! 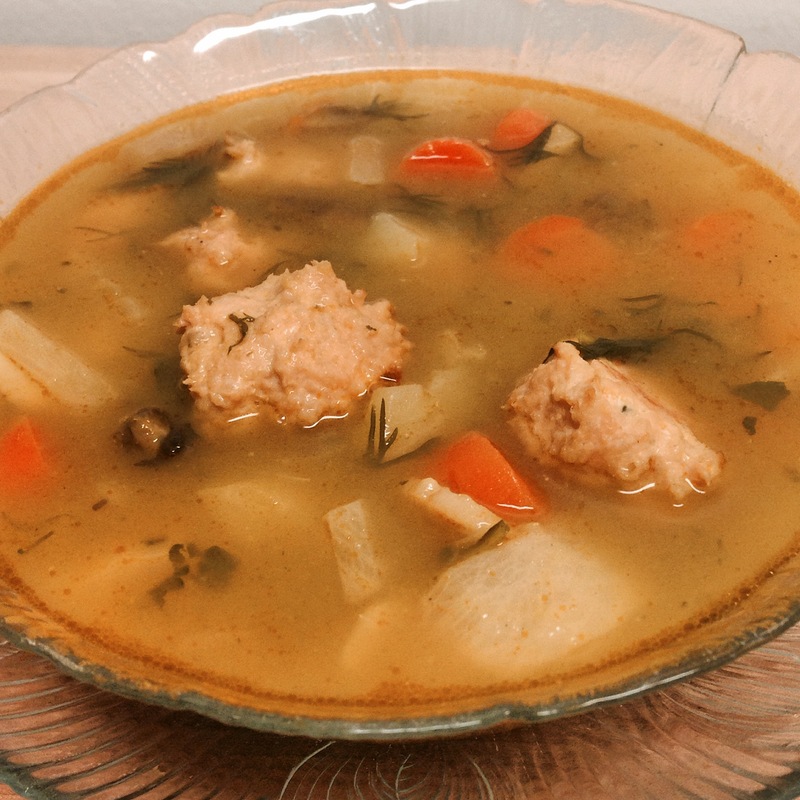 In fact, this hearty soup contains less than 250 calories per serving! I like to make a large pot of this soup on Sunday and enjoy the leftovers for lunch or dinner during the work week, when things are more hectic. Ready to bake the turkey meatballs in the oven! 1. Preheat oven to 360 degrees Fahrenheit. Spray two 9″ x 13″casserole dishes with nonstick vegetable oil cooking spray. Set aside. 2. Empty ground turkey breast into large mixing mixing bowl. Crack egg in separate, small bowl, scramble and add to large mixing bowl. Add breadcrumbs, garlic powder and onion powder to mixture and combine. Form small meatballs (about 1/2″ in diameter) and place in casserole dishes (4 rows x 6 columns). There should be about 48 small meatballs in total. Bake in oven 15-20 minutes. 3. Melt butter in large pot over medium heat. Add onion and cook for about 4-5 minutes, stirring occasionally. Add mushrooms and oil and cook another 3-4 minutes, stirring occasionally. Add kale, dash of salt and ground black pepper and sauté until soft and slightly wilted, about 4-5 minutes. 4. Add carrots, parsnips, turnips and potatoes to large pot. Cover with vegetable broth and water. Add turkey meatballs, remaining salt salt and a 1/8 tsp ground black pepper. Add dill (remaining on stem). Cover and bring to a boil. 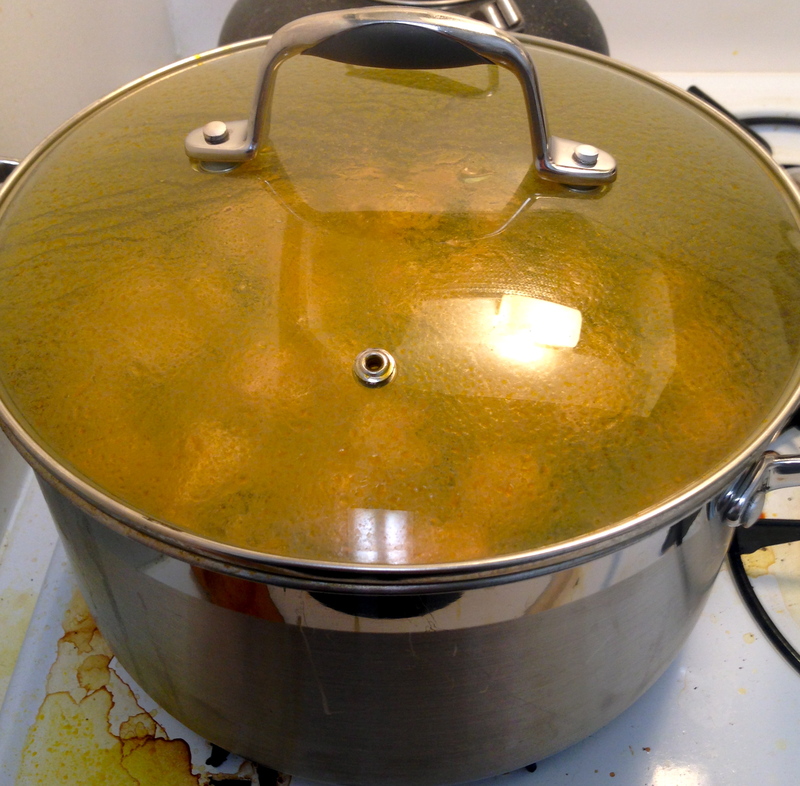 Let boil about 45 minutes (covered), until vegetables are soft. Reduce heat to a simmer and cook another 30 minutes. Enjoy! 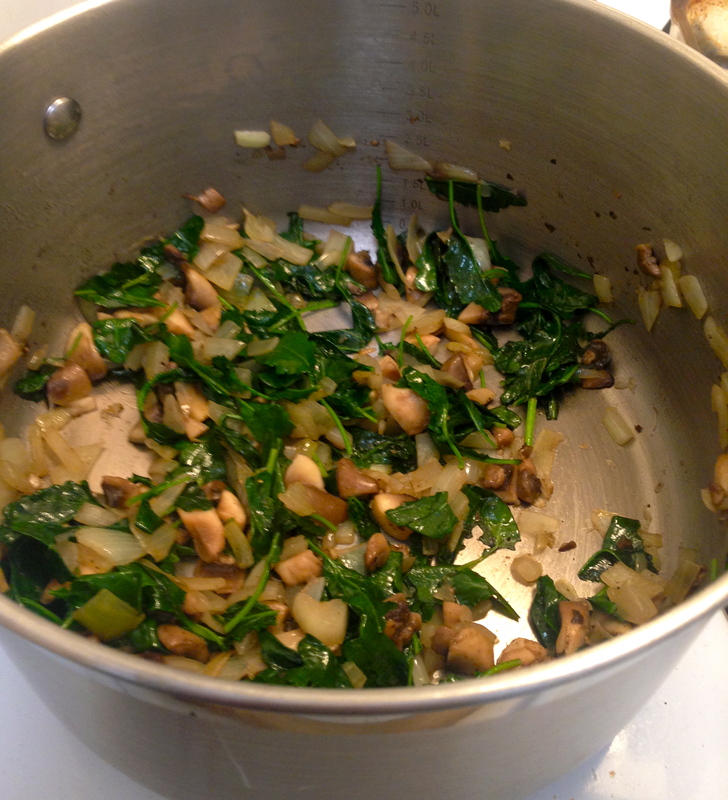 Sautéed kale, onions and mushrooms. Now just add the rest, bring to a boil and simmer!